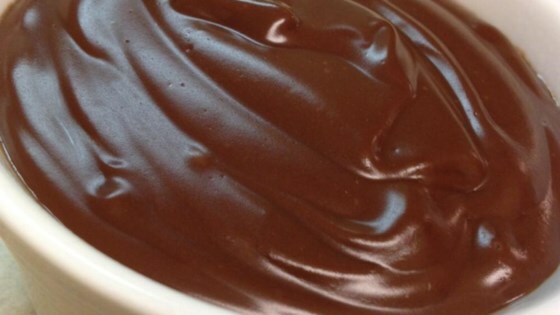 "This is a simple, smooth and creamy vegan chocolate pudding. I like to use ground chocolate as a substitute for the cocoa." In small bowl, combine cornstarch and water to form a paste. In large saucepan over medium heat, stir together soy milk, vanilla, sugar, cocoa and cornstarch mixture. Cook, stirring constantly, until mixture boils. Continue to cook and stir until mixture thickens. Remove from heat. Pudding will continue to thicken as it cools. Allow to cool five minutes, then chill in refrigerator until completely cool. See how to make a super-simple, 5-star chocolate pudding. Gag city!!! I won't even say what it tasted like. I thought this was great. Very creamy and rich. I decided to make mine sugar free and added four packets of sugar substitue in place of the granulated sugar. I will use this again! This was pretty good though I could not keep the cocoa from clumping together. Next time I'll mix it with a blender or mixer before heating it up. This pudding was excellent! My daughter is allergic to dairy products, and this made a very tasty treat. Although, I ate most of it myself. Thanks so much.